Follow the Honorable Phryne (pr. fry-nee) Fisher through the back alleys, shady markets, and jazz clubs of late 1920s Melbourne. A glamorous lady detective in a mostly male world, she goes about her work with a pearl-handled pistol and dagger-sharp wit, leaving a trail of male admirers in her wake. Essie Davis (Girl with a Pearl Earring) stars in the stylish series based on the best-selling novels by Australian writer Kerry Greenwood. 13 episodes, 11 3/4 hrs, 4 DVDs or 3 Blu-ray discs, SDH. Invited to a relative's home where a murder has just occurred, Phryne soon finds herself in a world of drug smuggling and illegal abortion. As she sets about solving the first crime, she ends up getting embroiled in the other two. On a train ride to the country, Phryne saves the life of a fellow passenger-but can't prevent the death of the young woman's mother. In tracking down the killer, she picks up a couple of runaway girls and begins to earn the respect of Inspector Jack Robinson. 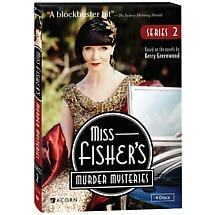 Phryne goes out for a night of dancing at Melbourne's top club, but the fun comes to an end after one of the patrons is stabbed to death. When a friend becomes the chief suspect, Phryne not only has to prove he didn't do it-she has to prove who did. The shooting death of a Latvian anarchist sets Phryne off in pursuit of the dead man's fiancee. In the process, she enters a dangerous underworld and puts not just herself in danger but her maid, Dot, as well. 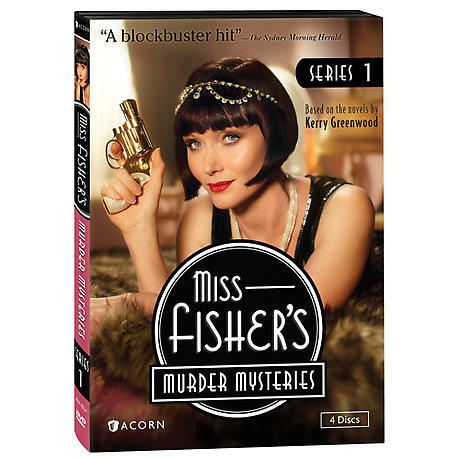 Phryne investigates a murder in Melbourne's Jewish community, where the motives are masked by politics, romance, and religion. Though the police make a quick arrest, Phryne believes the key to the case lies in an ancient Hebrew text. Two deaths onstage at a Gilbert and Sullivan show are followed by an attempt on Phryne's life and, eventually, a new romance in Chinatown. At first Phryne thinks the killings are connected with the modern-day opium trade, but soon she turns her attentions to explanations from the past. The widow of a French painter visits Melbourne, reawakening in Phryne memories of her time in Paris after the Great War. When the woman disappears, Phryne begins to fear for the safety of her two assistants, Bert and Cec. When a magazine columnist dies under mysterious circumstances, Phryne finds petty jealousies, deception, and, perhaps, a motive for murder among the dead woman's colleagues. Following the paper trail, Phryne searches for clues in the writer's unpublished files. A leisurely walk along the beach leads to Phryne's newest case after the body of a young woman washes ashore. Meanwhile, an unexpected visitor shows up at her house-the supposedly dead mother of one of Phryne's wards. A female night-shift worker dies when her hair gets caught in the factory machinery. 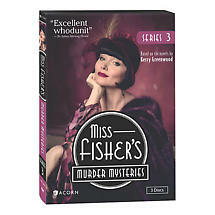 The police suspect accidental death, but Phryne smells foul play and Dot goes undercover to get at the truth. Phryne joins the circus to investigate a murder the police have little chance of solving-and takes a journey into a dark part of her own past. When Phryne gets some unexpected news, she fears the case closest to her heart may now be closed forever. Suspicion falls on the entire household when a body is found in the pool at Phryne's aunt's house on the eve of a lavish party. While Jack Robinson investigates the case, Phryne discovers a link to her sister Janey's death. With a madman on the run, Phryne throws caution to the wind in order to find answers she has been seeking since childhood. However, she may have to put herself in the clutches of her nemesis in order to finally lay her ghosts to rest. 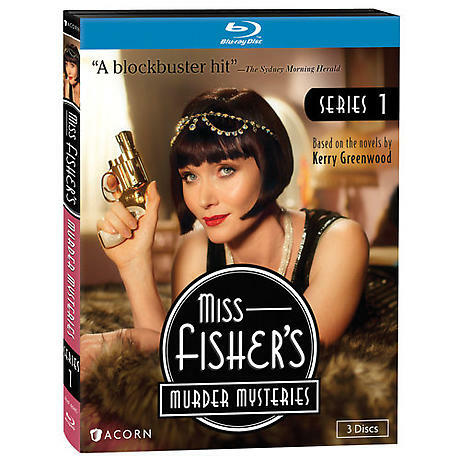 The Look of Miss Fisher's Murder Mysteries"
Rating: NR. Contains violence, coarse language, sexual situations and drug use.